John Kennedy Saxophonist / keyboard player playing an extensive play-list of pop jazz and standards. 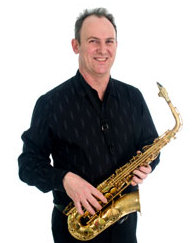 John is a musician of the very highest quality and is well known for his performances in popular bands and as a self-contained solo performer on saxophones, flute and clarinet. Accompanied by professionally recorded backing tracks, John provides music for weddings, private parties, corporate events, pubs, clubs and dances. A highly versatile musician John will play a range of different musical styles from classical, swing, easy listening to rock and popular music and will adapt both the nature and mood of his performance to suit any occasion. Over the years John has established a reputation second to none and has worked in all of the major hotels and venues in Scotland for a list of clients from private individuals to international companies. John Kennedy also performs with popular duo’s Shelley Blue and Bluesette and the well known 70’s disco band Groove Revue a fantastic party band that fills dance -floors all over the country .